My first adventure with Royce and Hadrian was last Fall when I was asked by Michael and his wife, Robin, to gamma read ‘The Disappearance of Winter’s Daughter’. I immediately fell in love with the duo, what with their combined quirks, good natured humor, and ways of dealing with constant obstacles; it just made me want more. Well, luckily for me, I have had the Riyria Chronicles’ audiobooks for quite some time and am now able to get around to them. Hadrian Blackwater and Royce Melbourne couldn’t be more different. Hadrian is a fast-talking, swashbuckling, three sword carrying mercenary and Royce is a mysterious, broody, and to-the-point assassin. How can these two possibly become partners, let alone friends? 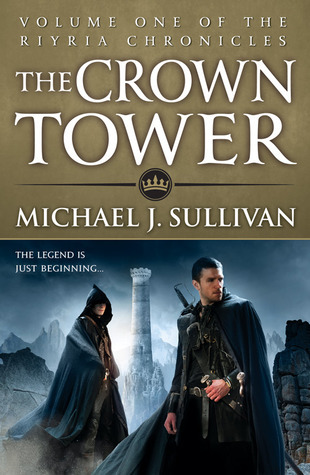 Well, that is why Sullivan wrote The Crown Tower. Think of it as a prequel to all of his other novels, but at the same time, as a stand-alone it its own right. Hadrian Blackwater, a blacksmith’s apprentice, left his father’s smithy as a young man in search of glory but could never find anything that quite satisfied him. Word of his father’s death reaches him and he races back home to meet Arcadius, his father’s old University acquaintance, who has a message to give him. Upon his arrival, he comes face to face with Royce Melbourne, whom Hadrian saw a few times on his journey to the University and automatically despises. Arcadius forces the two to work together in order to steal a book from the impregnable Crown Tower, a feat no one has accomplished before. Meanwhile, we are introduced to Gwen, a prostitute in Medford, who decides to build and run her own brothel after some untimely events force her hand. The reader is introduced to her rather quickly through her brief chapters but interest in her character builds as the book moves along. Sullivan has quickly become an author to keep on the top of the TBR pile. His knack for character development, world-building, humor, and plot twists make every single page worth the time taken to read. You will become engaged with the duo during their highs and lows, and you’ll be hankering for more adventures once you finish. The ending was one that I did not see coming and completely opens up the floodgates for more Hadrian and Royce. I cannot wait to see what’s next. Also, I just wanted to say that Tim Gerard Reynolds is amazing and I’m so glad he narrates all of Sullivan’s books. He will go down as one of the greats.